If you are pregnant with triplets, you may be both overjoyed and overwhelmed anticipating your new arrivals. Triplet pregnancies are exciting, but they present special challenges for everyone involved. Careful monitoring, proper care, and preparation are necessary to ensure that a triplet pregnancy is successful. Triplet pregnancy is on the rise. The major cause of increased triplet pregnancies is the increasing use of fertility treatments. Drugs that promote ovulation are an important factor. In a normal menstrual cycle, a woman releases only one egg. If that egg is fertilized by a man's sperm, it can become a baby. But, fertility drugs can cause a woman to release more than one egg at a time. If multiple eggs are fertilized at once, the result is multiple babies. Another cause is in vitro fertilization, in which eggs are fertilized outside the woman's body and then transferred to her uterus. Doctors usually transfer several eggs at a time, to increase the chance that one will implant and develop. Sometimes more than one egg begins developing, resulting in a multiple pregnancy. A triplet pregnancy may be discovered because the woman's belly is bigger than expected for a given stage in pregnancy or the doctor may notice more than one baby's heartbeat during a prenatal visit. Most of the time, though, triplets are discovered during routine ultrasound testing on women who have had fertility treatments. Ultrasound is considered the official way of diagnosing a triplet pregnancy. Being pregnant with triplets means seeing a lot more of your health care provider. Most women will choose to see an obstetrician, preferably one who has experience with multiple pregnancies. There will be frequent prenatal visits, ultrasound exams, and other tests to make sure that the mother is doing well and the babies are developing properly. Do not drink fluids with meals. Drink fluids about 30 minutes before and after meals. Drink bland fluids such as water or lemonade, in small amounts throughout the day to avoid dehydration. Eat frequent small meals instead of large ones. Take extra naps. But do not lie down right after eating. Avoid smells that nauseate you. Stay cool. Feeling hot can increase nausea. If your morning sickness becomes severe, consult your doctor immediately. He will screen you for hyperemesis gravidarum, a treatable condition which is harmful if left untreated. The doctor can prescribe something to ease your symptoms and prevent dehydration. Follow the doctor's orders. Your doctor will give you specific instructions ranging from the best resting positions to any allowable exercise. Talk on the phone with friends. Invite loved ones for visits. Organize photo albums and put together a scrapbook. Catch up on the movies you never had time to watch. There are many activities that you can participate in during bed rest. If you plan it right, it can be a mini vacation. As the pregnancy progresses, your belly will look larger than in a single pregnancy. You may find that the babies press on your stomach, making it hard to eat large meals. It's important to try to eat healthy foods, though, and the mother of triplets should expect to gain more weight than in a single pregnancy. 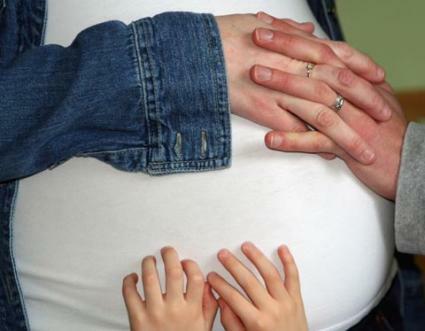 On average, women pregnant with triplets gain 30 to 55 pounds. 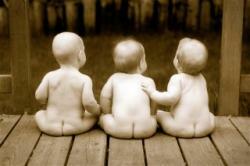 When triplets are discovered early in a pregnancy, it's possible that one or more of them will not develop into a baby. Most of these losses happen within the first nine weeks. One study of women who started out with triplets showed that about half of the mothers delivered three babies, one third delivered twins, and 18 percent delivered a single baby. Three percent of the women miscarried. One of the usual tests for birth defects, the triple screen, doesn't work with triplets. Ultrasound exams can help to reveal some birth defects. The doctor may also recommend amniocentesis or chorionic villus sampling, in which a tiny amount of tissue from the placenta is removed and examined. Half of women carrying triplets develop preeclampsia, or hyptertension, during pregnancy. This high blood pressure condition is diagnosed by measuring protein levels in the urine and with blood pressure monitoring. The only way to cure the condition is to deliver the babies. Gestational diabetes is another condition that exists exclusively during pregnancy. Women who are carrying multiples appear to have a greater risk of developing this condition. Doctors are still studying the best way to deliver triplets. It's not uncommon to need a c-section because the babies are not positioned properly for a vaginal birth. In other cases, vaginal delivery may be at least as safe as, if not safer than, a c-section. Vaginal birth of triplets involves a lot of medical care. Each baby needs to be monitored individually during labor. An epidural for the mother is highly recommended, because the delivery is likely to be difficult. The doctor may even need to reach inside the uterus to help position the babies. The woman should be prepared to need a c-section if there is a problem with the vaginal birth. After the birth, especially if it was premature, the babies may need to go directly to the neonatal intensive care unit. Premature triplets have similar risks and problems as single or twin babies who are premature, and tend to do about as well. Postpartum problems include low birth weight since the babies are likely to be born at about 32 weeks gestation. Babies weighing fewer than 5.5 pounds are considered to have a low birth weight in normal conditions. Babies weighing fewer than 3.3 pounds are at risk for problems as newborns. Another postpartum consideration is the increased possibility of depression in the mother. Johns Hopkins Bloomberg School of Public Health reports that women who deliver multiples are 43 percent more likely to have postpartum depression. Bringing the babies home is a memorable moment for parents of triplets. Many do not get to experience this joyous occasion right away. In many cases, parents can expect to have at least one baby having an extended stay in the hospital. With support from professionals, family, and friends, the new additions to the family should settle in to the home within a few months. Finding accurate information on the Internet about triplet births can be difficult. Many web sites relate personal stories, which can be helpful but won't apply to every case. The National Library of Medicine's web site, MedlinePlus, can be a good place to start your search for information about triplet birth. It provides links to reputable organizations with information about triplet pregnancy. It is exciting to be pregnant with triplets. Be sure to record your pregnancy in a diary, scrapbook or photo album. Years later, you and your three children can look at photos and enjoy reading about at your special journey.